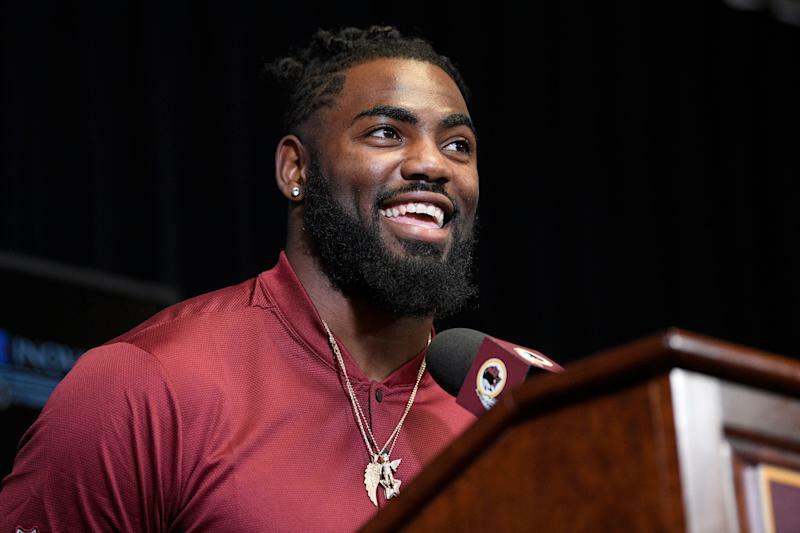 When Landon Collins signed a six-year, $84 million agreement with the Washington Redskins, much was made about Collins’ admiration for the late Sean Taylor. And in addition to a massive amount of money, Collins received another bonus — one that likely was priceless in his mind — from the team. Specifically from team owner Daniel Snyder. Check out Collins’ Instagram post of a signed Taylor jersey that Snyder gave to him after the contract became official. His caption — “this is unreal” — just about says it all on how much the gesture meant. Collins says he cried when he was given the autographed jersey last night. "Couldn't move,” Taylor said on Thursday. “Shaking." Collins was 13 when the former Redskins safety Taylor was shot and killed, and he explained in this ESPN feature on “Sunday NFL Countdown” — on the 10th anniversary of Taylor’s death in 2017 — how the then-New York Giants safety always kept Taylor in his memory. Taylor was on his way to being an NFL superstar when he was killed by intruders to his home in 2007, and many current players also chose him as an idol growing up. But Collins appeared to take his devotion to a very serious level. He told NFL Network just prior to the 2015 NFL draft that he grew up a Redskins fan, saying it would be his “dream” to play for the franchise. Of course, he was drafted by the Giants at the top of Round 2 after every team passed on him in the first round, but he wore No. 21 — Taylor’s jersey number — for his four seasons in New York. And that dream of playing for Taylor’s former team was deferred until his signing became official on Wednesday. Now comes the question: Will Collins be allowed to wear 21 with the Redskins? No Redskins player has worn that jersey number since Taylor’s death. Asked if he wanted to, Collins said, "I hope. Those are big shoes to fill." The Redskins’ controversial owner hasn’t exactly endeared himself to the locals since purchasing the franchise in 1999, even as they’ve spent big money on free agents, landed some big-name players and even brought back legendary coach Joe Gibbs, who helped the team return to the playoffs. The franchise has been cloaked in mediocrity for years, and Snyder’s personality and approach certainly have rubbed some diehard followers of the team the wrong way. He’s been viewed as cold, detached, money-driven and impatient at various times throughout his ownership, and Snyder and president Bruce Allen have come under fire as the team has gone south in recent seasons and even the franchise’s legendary season-ticket waiting list appears to have dried up significantly. But this gesture to Collins that Snyder made deserves our praise. And it clearly will receive a lot of attention in the closely knit circle of players, some of whom might change their views on Snyder after hearing about it. Owners in general might be businessmen who have the bottom line in mind, but it’s simple generosity and thoughtfulness such as this that can help bridge the sometimes large gap between the players and the people who fund their paychecks. Whether or not the team grants Collins the right to wear Taylor’s jersey number, it’s clear that Snyder already has made a terrific gesture for a player whose reverence for the former Redskins player runs deeply.